Rarely does a high school student’s excuse for missing a final exam come off sounding like Ivy League material. Then again, how many teenagers have to be in Washington, D.C., on a school night because the nonprofit organization they helped to create is being honored with the Robert F. Kennedy Human Rights Award? 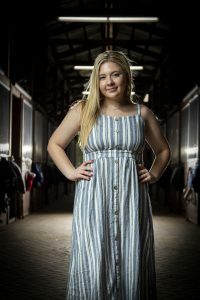 In the case of Jaclyn Corin, a senior at Marjory Stoneman Douglas in Parkland, who recently was accepted to Harvard University, the trip last June to Capitol Hill with the other MSD students behind March For Our Lives was one in a series of transformative experiences over the past 12 months—a journey that began with the deadliest high school shooting in U.S. history. While students like David Hogg and Emma González became early faces for what quickly grew into an international movement dedicated to gun violence prevention, Corin, with no blueprint to follow, took the lead behind the scenes—and never looked back. Six days after the shooting, she organized and led a group of MSD students to Tallahassee for a pivotal series of meetings with state officials that not only prompted the governor to take legislative action (Senate Bill 7026, signed into law by then-Gov. Rick Scott last March, raised the minimum age to purchase a firearm to 21 from 18, and banned bump fire stocks, among other provisions), but that also showed the world these high school students meant business. After helping to recruit artists and influencers for the national March For Our Lives event last March 24 in Washington, D.C., where she also spoke and introduced the granddaughter of Martin Luther King Jr., Corin turned her attention to a cross-country summer expedition that recalled the Freedom Riders, the civil rights activists who rode buses through the South in 1961. 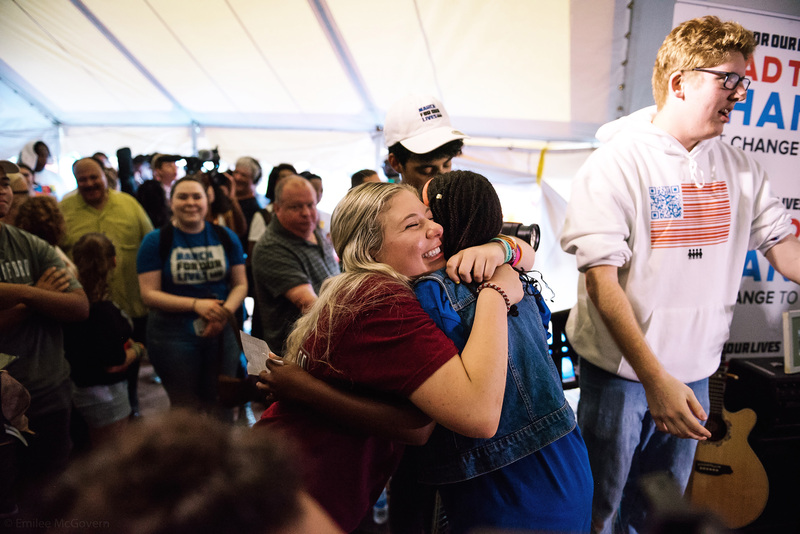 The two-month Road to Change tour, which included student activists from around the country, made nearly 70 stops in more than 20 states, a door-to-door mix of town halls, youth meetups and voter registration events that sought to educate Americans—in red states and blue states alike—about gun violence issues, as well as rally voters ages 18-29 to participate in the midterm elections. They did. According to a Tufts University study, 2018 marked the highest turnout for voters under 30 in the last seven midterms. Listening to Corin, who organized the daily logistics of Road to Change, speak so thoughtfully and with such insight about the past year, it’s easy to forget that the daughter of parents Paul and Mary is only 18—a teenager who, like some of her fellow MSD activists, has been verbally and physically threatened, and viciously attacked on social media. Asked during an exclusive interview with Lifestyle whether she was concerned about her safety during the summer tour, Corin says, “I’m always scared. I’m never not. But I have to put that aside. What has this school year been like at Stoneman Douglas? It’s really hard to walk into that school every day. I park my car and walk past the 1200 Building, where the shooting happened, and I see the doors with the huge lock. That’s how we start our day. You’re constantly reminded—whether it’s a police officer [walking by] with a backpack, where you know there’s a gun inside, or just a poster on the wall that says “MSD Strong”—that this isn’t the same school. Some days, it weighs on you. Other days, you’ll forget for a bit. But then you’re in astronomy class, and you’re learning about Jupiter’s moons, and the thought will hit you—a thousand feet away, that’s where it happened. And you’ll have a panic attack. It’s such a hard thing to balance. You never know if people do want to talk about it, or if they don’t want to talk about it at all. Some people can’t read the room, and they just talk about it because they’re caught up in what makes them feel better. Some teachers talk about it more than others because that’s their way of coping. But it may make others feel uncomfortable. [All things considered], I wouldn’t want to go to another school. At another school, I’d feel even more isolated. No one would understand. Despite all the great things that March For Our Lives is doing, we all agree that we’d take everything back to just go to school [and have our friends and teachers alive]. Did you seek counseling this past year? I didn’t go to a therapist after the shooting because I was so busy. Literally, the day after, I was on the phone with a congresswoman [arranging the bus trip to Tallahassee]. That was my way of coping in the moment, of removing myself from my anger and sadness and channeling all of that into something good. I finally went to a therapist in August. And, honestly, it didn’t help. The real therapy was talking it out with my friends, meeting new people, and doing something productive after the shooting so that other people don’t have to feel like this. Sometimes, when I’m talking like I am right now, I remind myself why we’re talking. Because there was a shooting. Same when I’m on panels or at events. I’ll speak about gun violence and forget that I’m a survivor. It’s a weird thing to explain if you haven’t lived it. But you have to make sure you’re grounded and go back to why you’re there. Along those lines, has it been a challenge to reconcile your own notoriety in light of what prompted this journey? I’ve had the comment, “You’re profiting off of this,” or “You’re standing on the backs of 17 people.” I’m not at these events, and I’m not doing interviews because of [a desire] to profit off the tragedy. It’s because [this is] my reaction to the tragedy. Feb. 14 was a Wednesday. By Saturday, the movement was taking flight. What stands out to you about those first few days? There were two main reactions after the shooting. One was to do interviews and speak out immediately, and that was more David [Hogg] and Cameron [Kasky] and Delaney [Tarr] and, later, Emma [González]. The morning after, I woke up at 5 a.m. When I was driving to the Parkland rec center, I was on the phone with a congresswoman. That was my reaction. When I was hiding during the shooting, it wasn’t, like, what the hell—how is this happening? No, it made sense. It wasn’t a surprise at all. So, we needed to show the world that we’re not going to take this; we’re fed up. I talked to the congresswoman that night at the vigil. She connected me with a Florida state senator the next day. 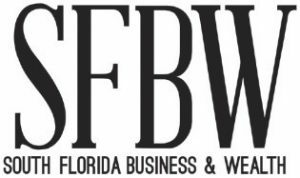 We were creating the trip to Tallahassee; initially, it was going to be for students all over Florida, but if we wanted to do it fast, and make it powerful, it had to be Stoneman Douglas students. I did all the organizing. I’d wake up at 6 a.m. and go to bed at 2 a.m. I made so many phone calls. So many phone calls. … I contacted the bus company, contacted parents, contacted chaperones, reached out to the Civic Center in Tallahassee, organized cots from the Red Cross. We got to Tallahassee, we slept on cots in the Civic Center, we had the meetings the next day, and we came home. It ended up being 100 students and more than 70 congressional meetings. How important, in retrospect, was the trip to Tallahassee as far as setting the stage for what would come? The effect of that trip was immense. It was one of the first things that everyone saw, along with Emma’s [“We call B.S.” speech at the federal courthouse in Fort Lauderdale]. It showed we weren’t [expletive] around. That was the vibe. We wanted to show people that we were serious about policy but also about making noise, which is what the march represented. It was important because the press then focused on something other than people crying. That’s how people covered Sandy Hook and Vegas and Columbine. This was a different story. Yes, the victims were still being honored—but, also, there was something positive happening. I’ll always be proud of my initial reaction. Before all this, I was kind of a shy, nervous girl. Now? I’m a completely different person. I was in the building 15 minutes before the shooting, passing out carnations for Valentine’s Day. I had just returned to my study hall. I know my life could’ve been taken that day. So, I’m completely transforming my life. Because I can. Because I’m living. My brain is functioning. My heart is beating. I’m going to do something about this. 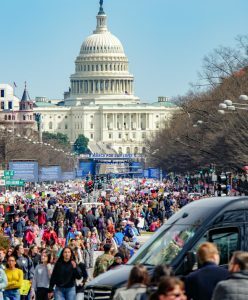 What stays with you about March For Our Lives in Washington, D.C.? Is it looking out on that sea of people while speaking, or something behind the scenes? Two things. Obviously, the thing I play over in my head definitely is being on stage and speaking. But the first thing is when I was walking out on stage. My immediate reaction, my immediate fear, was that I was going to get shot. There were [hundreds of thousands] of people in front of me, and I was this person who had been vocal. I was having [this conversation] in my mind: I don’t think they would shoot me, would they? Why me? That was my fear. You can tell when you watch the speech, I was shaky in the beginning. That was the reason. It wasn’t because of speaking in front of the crowd. I was shaky because of a [possible] sniper. But there were sniper [spotters]; I could see them from the stage. There’s a moment where you can see in my eyes that I get more confident. I also knew that I was bringing Martin Luther King Jr.’s granddaughter on the stage. I was so excited to see Yolanda [Renee King, who was 9 at the time] have that moment. There’s a picture of us holding hands, and it’s so beautiful because it’s this weave of white and black. She’s so cute. I love her so much. This is so funny. My brother was backstage watching me give my speech—and he was holding hands with Miley Cyrus. (She laughs) Like, what? How cool is that? In that moment, they were equals. I’ve grown so much since then. I look at that video, and I was so young. So innocent. What continues to be the biggest misconception about the work you and your fellow students have been doing? Whenever we had “Road to Change” events in places like North Dakota or Texas or Wisconsin, the common argument was that “You’re trying to take all my guns.” People would walk right up to me and scream that in my face. We’re not. So, then we’d have conversations about extreme risk protection orders or universal background checks or disarming domestic abusers. And they’d be like, “Oh, I can get behind that.” After going through all of the policy points, most people would agree with eight or nine of the 10 points. It really is a matter of having conversations and listening to one another. People would leave realizing we’re not trying to take guns. [We] just want to make sure that [a gun is] stored properly so a toddler doesn’t reach it. Or make sure that someone who has made [violent] threats to others doesn’t have access to that firearm to take a life so easily. Minds can change. I changed my own father’s mind. The night of the shooting, I immediately said this was a gun problem. He said, no, this is purely a mental health issue. Within two weeks, he completely understood [the movement’s intent]. That’s why we called it March For Our Lives and why we always say “gun violence prevention” instead of “gun control.” … You can’t say, “I don’t want to prevent gun violence, I don’t want to save lives.” Because then you’re a douchebag. Why did you feel the door-to-door approach was so important when it came to the Road to Change tour? No. 1, we wanted to show people we were real because we were being seen as “crisis actors” sometimes. We also knew that face-to-face conversations could change minds. Ultimately, social media is only so powerful. We wanted to connect with organizers around the country, people who had organized marches and who had been vocal. The best way to do that was to visit them, to dedicate our summer to meeting people and spending an entire day with a community. It was difficult. We’d have 19- and 20-hour days. But we knew it would be a moment for the world to watch a group of high school and college students travel the country because we’re so passionate about this issue—because we want to make a change. The coverage was enough to motivate so many more young people to stand up. 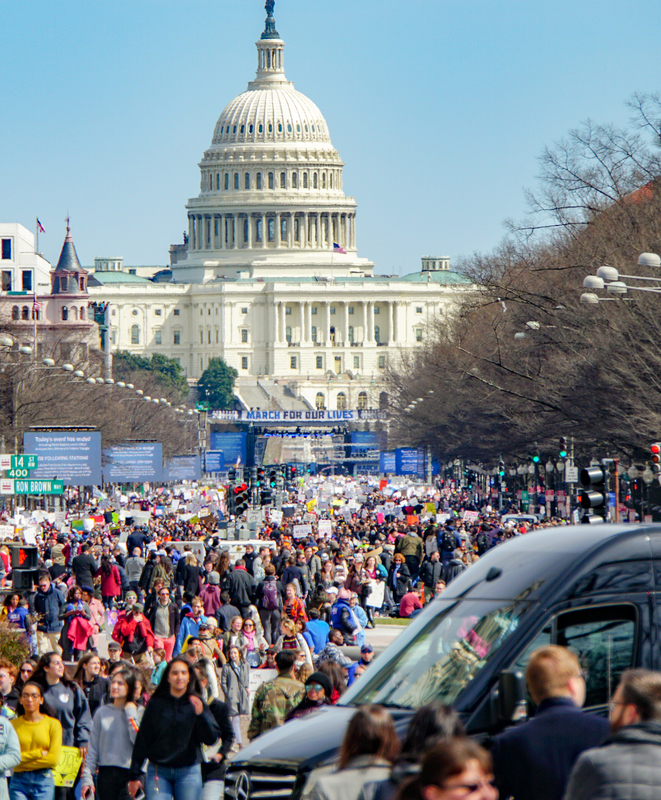 An overwhelming amount of people say that they were motivated by the march, but they were really driven to do something because they saw we kept going. There are so many communities we should understand and connect with as shooting survivors. That’s why we went to Ferguson, that’s why went to Newtown, that’s why we went to Chicago. Gun violence looks different in all those communities, but there’s still a shared thread. We need to understand it to keep growing as an organization, to keep connecting with different groups and building coalitions. That’s what makes us sustainable. Corin shares an emotional embrace during a Road to Change event in Newtown, Connecticut—where the Sandy Hook shooting took place in 2012. What did you learn about America and its attitudes toward guns and violence prevention that surprised you? America is on our side. That’s what I learned. Our town hall was overflowing in Salt Lake City, Utah. There was overwhelming support from people in places where you thought you were going to get the most hate. The biggest counterprotest we had was in Bismarck, North Dakota. It was organized by the city’s mayor and the congressman of that district. There were 50 people at the protest. There were 250 inside the town hall—all supportive. In Bismarck, North Dakota. I respect it the most when people disagree with us but they still come in and listen. We welcomed it when people disagreed. Every policy point we push has the majority of the American population on its side. When you have conversations with people, the biggest disagreement is over a semiautomatic assault rifle ban or over a high-magazine ban. Those are the two that are long-term, hard-to-reach goals. With regard to anything else we talked about, people were receptive. You must have met so many fascinating people this summer. Who stands out? The people on the bus with me [this summer], the people we recruited. It wasn’t just Parkland students, it was students from all over the country who came on the bus. There’s also one amazing girl who I look at as a mentor; her name is Bria Smith. We’re both 18. I’m white; she’s black—and she lives such a different life. She’s from inner-city Milwaukee, and she’s dealt with gun violence her entire life. She says, “If I don’t fall asleep to the sound of gunshots, it’s a weird night.” Her story—her bravery and strength—inspires me. … She’s taught me so much about what it means to accept and understand my privilege. I actually wrote an entire college essay about it. We weren’t brought together because we’re victims or because we know a victim. We were brought together because we’re activists against what happened to the people we know. When it comes to the original intent of March For Our Lives and Road to Change, what are you most proud of? There are two big successes we’ve accomplished so far. One is the social and cultural feel of the country; it’s people understanding that speaking out about gun violence is incredibly important and should be integrated in our lives. It’s about awakening a generation of young people, not only to speak out about gun violence but whatever they choose. It’s about empowering that youth to understand that their voice is valued. And then, it’s the political side. We saw nearly 70 laws passed in state legislatures. [Editor’s note: According to a Dec. 14 story in the New York Times, state legislatures passed 69 gun control measures since Parkland. And legislators rejected 90 percent of state-level bills backed by the National Rifle Association.] There are conversations going on about universal background checks and [Centers for Disease Control and Prevention] research on the federal level. We helped to do this, but it’s also due to the social change and the pressure coming from millions of people. The federal government needs to look at [what’s happening at the state level] and realize these measures work. If we make them federal laws, we’ll actively save lives. You’re senior class president at MSD this year. Do you try to weave in the activism that’s become a part of your life? The role of a class president, really, is about fundraising for prom. The way they intertwine is that I’m better at talking to people now. So, when I have to get on the phone to order doughnut walls [as a backdrop] for prom, it’s not as difficult. I know how to organize events. I organized the entire summer for [Road to Change]. Organize a prom? No biggie. I go to meetings with 30-, 40- and 50-year-olds and discuss social media strategy or some policy. And then I get to go to school with 17- and 18-year-olds and talk about my prom dress. It’s definitely weird. But it’s necessary for me to be the adult and be this businesswoman—but also be the 18-year-old girl that I am and that I should be. In a recent Vanity Fair profile, you said you didn’t want to be a politician because “politics is always going to be dirty.” Do you feel differently now? Definitely. I can see myself running. But I need to go to college and grad school first. I’ll always be involved in the social justice/nonprofit space, whether it’s organizationally or more politically. My major is political science, so I’m going to be involved one way or another, whether it’s running myself or running someone else’s campaign. What changed since this summer? It’s my confidence. It’s me finding myself and what I really care about. I’m a remarkably different person than I was even three months ago. That’s what is so amazing. Usually, as a public figure, you’re torn down. It’s the opposite for me. I’ve been built up. I got into college and still maintained good grades while doing all of this. I’m comfortable saying this: I’m a badass. I truly am. I know what I’m capable of, and I know that no one can bring me down.